Department of Pharmacy Practice, Al-Ameen College of Pharmacy, Bangalore, Karnataka, INDIA. Department of Cardiology, St. Philomena’s Hospital, Bangalore, Karnataka, INDIA. Department of Pharmacy Practice, Rhodes University, Grahamstown, SOUTH AFRICA. Cardiovascular diseases have become the single leading cause of death and disease burden globally in low and middle-income countries such as India. The relatively early onset age of cardiovascular diseases in India in comparison to Western countries also implies that most productive ages of the patient’s life are lost fighting the disease. Deaths associated with cardiovascular events remains constant in many countries due to new therapeutic approaches for prevention and treatment of cardiovascular diseases. This condition is widely attributable to unhealthy outcomes in its association with risk factors such as age, obesity, dyslipidemia, smoking, low socioeconomic state and sedentary lifestyle which play a significant role in the progression of cardiovascular diseases. Prospective observational study conducted in a tertiary care hospital in Bangalore over 6 months. Subjects between 30-89 years of age visiting in and out-patient department of St. Philomena’s Hospital, Bangalore were enrolled in the study. Subjects with diabetes mellitus, hypothyroidism and who were on anti-hyper lipidemic agents were excluded. 92 subjects (44 male and 48 female) were included in the study, among whom 48 (52.2%) were in the age group of 50-69 years. Abnormal total cholesterol and Low Density Lipoproteins were found more in male subjects and abnormal High Density Lipoproteins and triglycerides were found predominantly high in female subjects. Approximately 62% of study participant were obese and overweight, only 34 out of 92 participants were doing physical activity, nearly 91.3% were belonged to lower socioeconomic class and among male participants 32 of them were current smoker. The result indicated that as the age increases, the risk of CVD raises. Our study showed that the common risk factors among our subjects without comorbidity were age, obesity and over-weight, dyslipidemia, physical inactivity, low socioeconomic status and smoking. The aim of this study was to determine the risk parameters of healthy individuals such as age, BMI, dyslipidemia, physical inactivity, low socioeconomic class and smoking, in the study population. Prior approval was obtained from the Institutional Ethical Committee of hospital and written informed consent form was taken from each participant before enrolled them in the study. This prospective observational study was conducted in a tertiary care hospital in Bangalore. Study consisted of 92 volunteers, who attended the outpatient and inpatient of St. Philomena’s hospital for various conditions. Patients of age 30 years and above were included in the study and patients with pre-existing CVD, DM, hypertension and hypothyroidism were excluded. Collected information was analysed using Microsoft Office (MS-Word and Excel) 2016. Descriptive data analysis was performed in the form of percentage of demographic variables. The study population comprised of 92 subjects and included 44 males and 48 females. .. According to WHO classification of BMI, nearly 62% of our study subjects would fit in overweight/obese class and 17.39% of subjects had normal BMI of 18.5-22.9. Based on gender, 70.83% of females and 52.27% of males were pre-obese/obese. 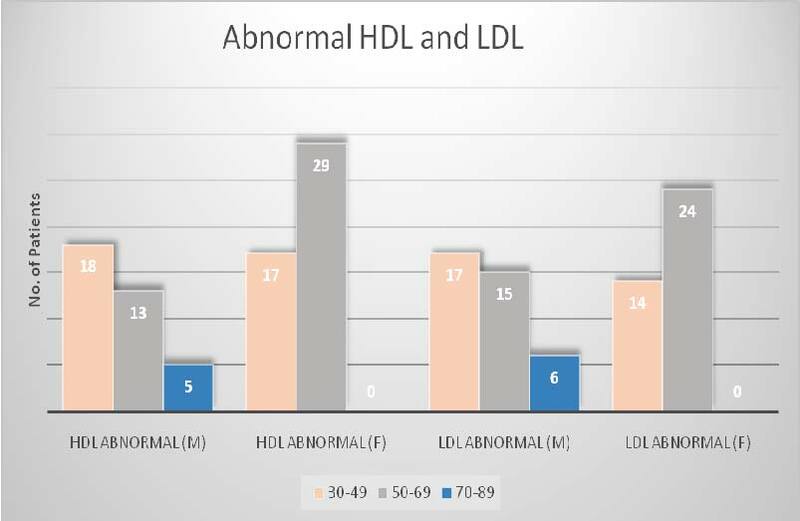 The prevalence of hypertriglyceridemia and low HDL were significantly more in females but hypercholesterolemia and high LDL were higher in males (83% vs. 79%, 95% vs. 81%, 31% vs. 27%, 42.6% vs. 86%) respectively (Figure 1 and 2). Self-reported physical activity of the participants showed that out of 92 study subjects, only 34 were being physically active [36.95%]. Based on the socioeconomic status approximately 91.3% of study subjects belonged to upper lower and lower class (Kuppuswamy scale). In the study, out of 44 males, 32 reported to be smokers, 46.87% were in age group of 50-69 followed by 37.5% in 30-49 and remaining in 70-89 years of age. 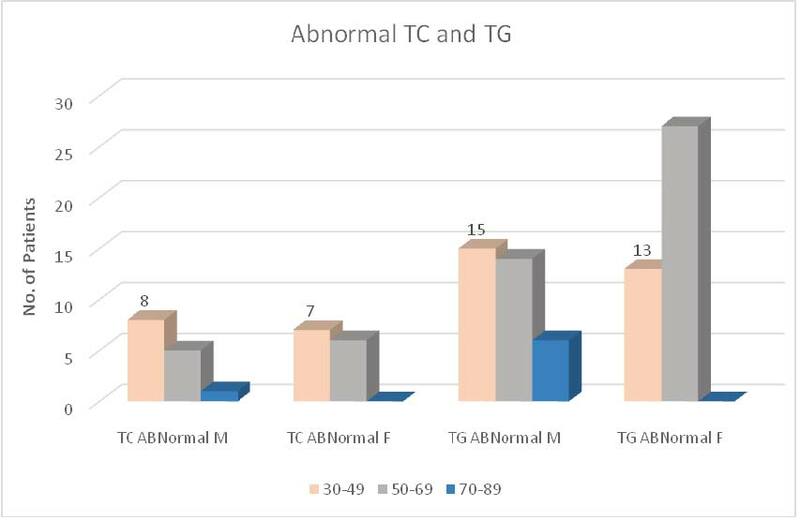 This Figure showed the abnormal Total cholesterol and Triglyceride level in male and female study subjects. 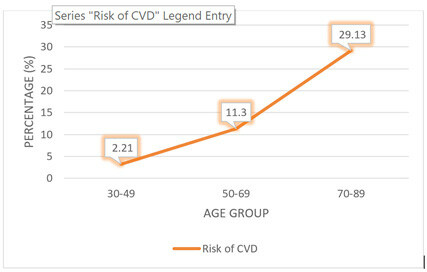 This Figure showed as the age is increasing the risk of cardiovascular diseases also increased proportionally. This table demonstrate the dyslipidemia as per Age and Gender. Compared with the western populations, Indians tend to have higher TG levels and lower HDL-C levels but the total cholesterol and LDL-C levels are generally lower, similar to this study, in case of TG and total cholesterol. Serial epidemiological studies in India suggest a rapid rise in the mean levels of LDL-C and TG, and our study also showed the mean of 129%, 185.1% respectively which were high based on NCEP-ATP III guideline. Based on the various studies across India, range of hypercholesterolemia was found between 20-35% but our study showed 10.4%, which was lower than the range described (Table 2). This table showed the mean level of Age, BMI, Blood Pressure, Heart age and Lipid profile parameters of participant. Indian and Indian migrants have atherogenic dyslipidemia (high TG and low HDL level) due to environmental factors such as socioeconomic status and genetic predisposion, atherogenic dyslipidemia found to be associated with cardiovascular diseases, in comparison with western population, Indian are more prone to get atherogenic dyslipidemia.17 The result of our study indicated 36.95% of participant had atherogenic dyslipidemia. In a study carried out by Karpov.Y et al in 2015 in Russia, rate of hypertriglyceridemia was 29.2 %.18 Globally, around 23% of adults aged 18 and over were not active enough in 2010 (men 20% and women 27%). There is enough evidence that physical inactivity is an important risk factor for development of CAD, obesity, dyslipidemia.19,20,21,22 Physical activity is associated with reduction in risk for CAD and obesity. In India, a large percentage (392 million) of the people are physically inactive23 and our study also indicated that majority of patients were having sedentary life style (58 out of 92), and females [65.51%] were physically more inactive than males [34.49%]. Lower socioeconomic status (SES), whether assessed by income, education, or occupation, is linked to a wide range of health problems.24 Lower SES is associated with higher mortality, and the greatest disparities occur in middle adulthood (ages 45–65).25 Education improves the cognitive skills and assists in navigating the health care system and enhanced self-care.26 Adults with a higher education—especially in today’s knowledge economy—have conspicuous advantages in gaining employment and finding desirable jobs. Advanced degrees give workers not only high salary and job satisfaction but also health benefits.27-29 In our results, also 91.3% of participants belonged to lower socioeconomic class. We wish to thank the management of Al-Ameen College of Pharmacy, Management of St. Philomena’s Hospital, Bangalore for the support extended in the completion of this project. We also thank Mr. Anas Abdul Salam and Mr. Mohammed Kazim Sheriff, staff of Al-Ameen College of Pharmacy for their support and help in the conduct of the research. Cardiovascular diseases have become the single leading cause of death and disease burden in India. The relatively early onset age of cardiovascular diseases in India in com-parison to Western countries also implies that most productive ages of the patient’s life are lost fighting the disease. Deaths associated with cardiovascular events remains constant in many countries due to new therapeutic approaches for prevention and treatment of cardiovascular diseases. This condition is widely attributable to unhealthy outcomes in its association with risk factors such as age, obesity, dyslipidemia, smoking, low socioeconomic state and sedentary lifestyle which play a significant role in the progression of cardiovascular diseases. The methodology used in the study was prospective observational study conducted in a tertiary care hospital in Bangalore over 6 months. Subjects between 30-89 years of age visiting in and out-patient department of St. Philomena’s Hospital, Bangalore were enrolled in the study. Subjects with diabetes mellitus, hypothyroidism and who were on anti-hyper lipidemic agents were excluded. 92 subjects (44 male and 48 female) were included in the study, among whom 48(52.2%) were in the age group of 50-69 years. Ab¬normal total cholesterol and Low Density Lipoproteins were found more in male subjects and abnormal High Density Lipoproteins and triglycerides were found predominantly high in female subjects. Approximately 62% of study participant were obese and overweight, only 34 out of 92 participants were doing physical activity, nearly 91.3% were belonged to lower socioeconomic class and among male participants 32 of them were current smoker. The result indicated that as the age increases, the risk of CVD raises. our study showed that the common risk factors among our subjects without comorbidity were age, obesity and over-weight, dyslipidemia, physical inactivity, low socioeconomic status and smoking. The rising incidence of cardiovascular diseases in India:Assessing its economic impact Shraddha Chauhan, PhD Scholar; Bani T. Aeri, PhD. Dhaka V, Gulia N, Ahlawat KS, Khatkar BS , authors. Trans fats-sources, health risks and alternative approach – a review. J Food Sci Technol. 2011;48(5):534–41. doi: 10.1007/s13197-010-0225. Anjana RM, Pradeepa R, Das AK, Deepa M, Bhansali A, Joshi SR , authors. et al. ICMR–INDIAB Collaborative Study Group. Physical activity and inactivity patterns in India – results from the ICMR-INDIAB study (Phase-1) [ICMR-INDIAB-5]. Int J BehavNutr Phys Act. 2014;11:26doi: 10.1186/1479-5868-11-26. Kaplan GA, Everson SA, Lynch JW , authors. The contribution of social and behavioral research to an understanding of the distribution of disease: a multilevel approach. Smedley BD, Syme SL , editors. Promoting health: intervention strategies from social and behavioral research Washington, DC: National Academies Press; 2000. Used with permission. Sekhri T, Kanwar R, Wilfred R, Chugh P, Chhillar M, Aggarwal R , authors. et al. Prevalence of risk factors for coronary artery disease in an urban Indian population. BMJ Open. 2014;4(12):005346similar to our study results which also showed majority of males (32 out of 44) as smokers. Cite this article : Eidgahi EZ, Shaik R, Hiremath SRR, Patil CB, Srinivas S. Assessment of Risk Factors for the Cardiovascular Diseases in People Visiting a Tertiary Care Hospital for Routine Medical Check-Up. J Cardiovasc Disease Res. 2018;9(1):32-5.